After treatment, the area may be dressed with compressive tape or stockings, or an elastic Ace wrap for a period of time. The veined area often looks a bit bruised initially, and the color slowly fades over the course of a few weeks. Some people can have a bit of brownish discoloration (hyperpigmentation) occur to the area during the healing process. This hyperpigmentation fades as well, but may take months. Spider veins may also be treated with a laser. In this method, an intense beam of light is directed at the spider vein, which obliterates it through the skin. More than one laser session may be needed to obtain the desired results. Sometimes, laser therapy is used in combination with sclerotherapy. They depend on the procedure opted for. It depends on the above procedure opted for. With its outstanding team of Dermatologists, Allure MedSpa helps you neutralize frown lines, wrinkles, fine lines, scars and thread veins in its state-of-the-art facilities at highly affordable, value for money prices. No wonder, patients from all over the world throng Allure MedSpa to achieve their cosmetic and skincare goals. The Thread vein removal procedure plan will be customized after the dermatologist examines your veins and their spread. After two months, your veins treatment should have completed its healing. At this point, you and your Dermatologist will decide if any additional treatment is necessary. More than one treatment session may be required to obtain optimal results. 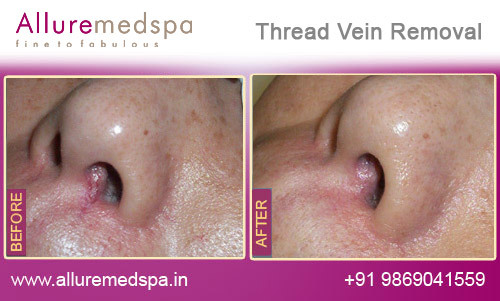 After each spider vein treatment, you will notice improvement of your skin’s appearance. However, it is important to realize that new spider veins may surface in the future. As time passes, you may want to consider further treatment to take care of any new veins that may emerge. The ideal candidates for sclerpotherapy are non-smokers who are physically healthy and psychologically stable. Since it is not known whether the sclerosing solution affects breast milk, pregnant women should avoid sclerotherapy. Spider vein treatment requires no anesthesia and is usually performed in an outpatient setting. Is thread vein removal permanent? 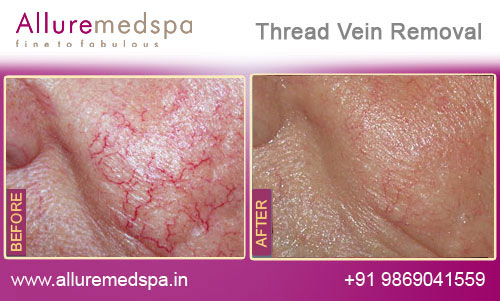 What happens after thread vein removal treatment? Immediately following treatment, the treated veins will become red and swollen but not painful. Occasionally small areas of blistering or crusting can occur. These reactions usually disappear within hours or a few days. The area should be kept well moisturised and away from sunlight. The treated veins take up to 8 weeks to disperse naturally in the body before you see the final result and any further treatments can be carried out. 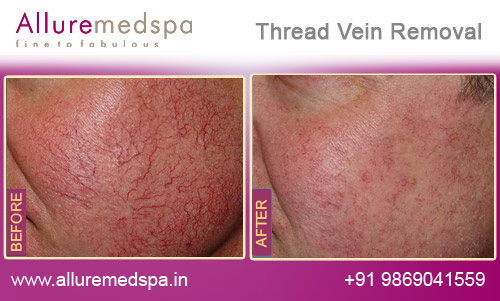 Am I suitable for thread vein removal treatment? 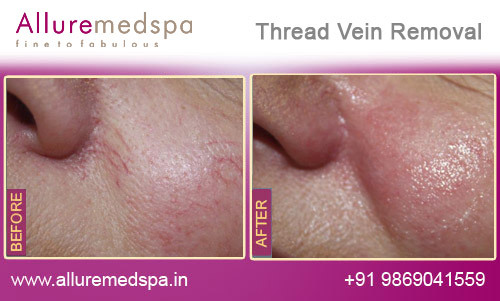 To find out whether you would be suitable for thread removal, please contact Allure medspa on +91 98690 41559 arrange a consultation. 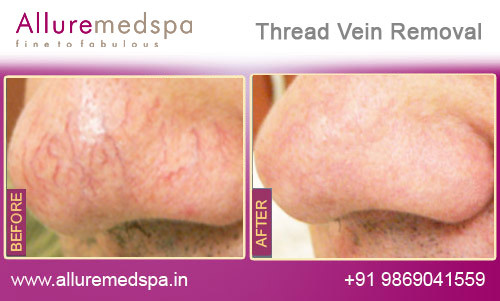 Call Allure medspa on +91 98690 41559 today to order a brochure on thread vein removal or request a call back.